E-Book Library- Access e-books from the Baker & Taylor Axis 360 library. Be sure to first choose either Adobe Edition App (for Sony Reader, Nook, Kobo and other e-reader devices) or Blio App (for Windows based, Apple based or Android based devices or PCs) for housing the e-books. *For virtually all Android device users, you should receive your BLIO update automatically, but if you do not, click here and manually update. 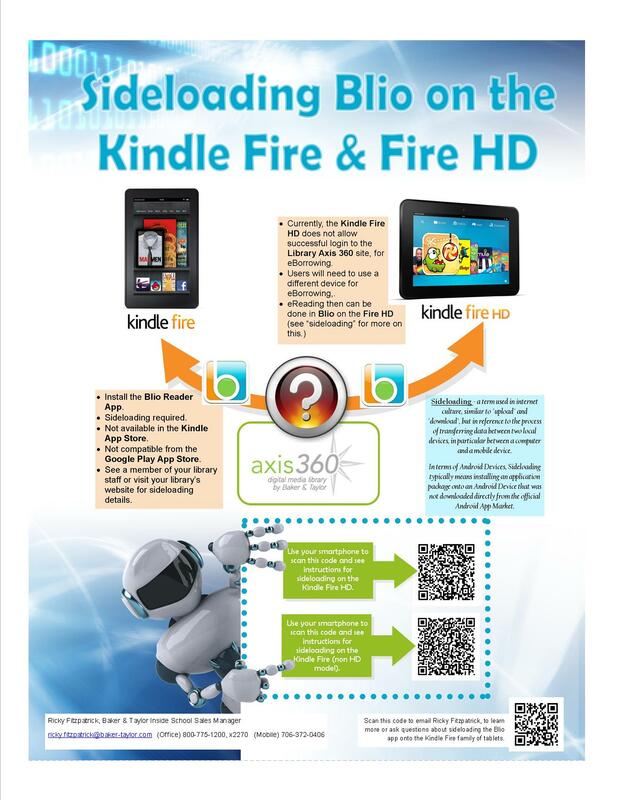 *For Kindle Fire devices, if you are familiar with the "sideloading" process required to install BLIO, click here and watch the video. eBooks with Freading- Freading is a new eBook service for Wyoming library users. - Books range in token value from 1 to 4 tokens, with most newer titles being 4 tokens. Zinio- View full digital copies of over 150 magazines for free on your computer or mobile device. Available to all Wyoming library patrons. of the world's books. Find millions of great books you can preview or read for free. Unglue It- To make it clearly legal for a digital book to be used, distributed, archived and preserved by libraries. 3MCloud Library- A growing collection of over 3,000 popular fiction and nonfiction titles. Available to all Wyoming library patrons. Story Place- Online stories with activities and reading suggestions for beginning readers. Wyoming Talking Books Service- Free library services for visually, physically, and reading disabled people through the Wyoming Department of Education. Bartleby- Internet publisher of literature, reference and verse with unlimited access to books and information on web, free of charge.